These words rang in my ears as I watched Travis Roy finish his speech. He was a man with such high hopes only to find himself locked in the confines of a wheelchair. His presentation was so thought-provoking and inspiring I wanted to know more. I went on to read his book Eleven Seconds and found myself in tears more than once. Who knew that eleven seconds could hold the absolute highlight and the ultimate low of your life. Yes, eleven seconds. When someone talks about, “living their dream” they expect to live it. Travis was cheated out of that opportunity. Imagine living life to the fullest, and achieving all your goals. That was where Travis Roy was headed. Everything had fallen exactly into place. As a freshman Travis remembers, “On a fall afternoon I sat at my desk, paper and pencil in hand, and wrote down my list of goals.” As a young boy with a bright future, he made a list of his dreams. He felt each dream get farther and farther out of his reach. He knew, though, that he could do it. He had the power and the talent. With his parents behind him, his options were endless. Hockey has been in Travis’s life since he was 20 months old. “He got on the skates and that was it,” his father recalls. You could almost say that hockey was in his bones. His father managed four ice rinks over the years and became “Mr. Youth Hockey” in Southern Maine. And that wasn’t all. His father was University of Vermont’s MVP in the mid-60s and was later inducted into their Hall of Fame. Even though Travis was involved in other sports such as soccer, hockey was where his heart lay. He put all his efforts into becoming the best player he could be. For seven years of his youth Travis worked as “stickboy” for the Cumberland County Civic Center. He was always on call for the players, whatever they needed. Before he knew it he was the “unpaid gofer”, fetching gum and delivering cups of water. In exchange for his work his father would take him for three hours before a game to practice shooting. The head coach for the first three years of his “stickboy” career took him “under his wing”. Tom McVie made sure to keep Travis in check. Always asking, “Are you getting any assists?” After all the time he spent at the Cumberland Civic Center he felt as though “he had a Master’s Degree in the sport.” The coaches allowed him to sit in on pep talks, and he got a feel for just how hard the players worked. When Travis hit the boards eleven seconds after his college debut he knew it was over. Something told him that this was the end. The thing that sealed the deal was the hand he saw moving in front of his face. The glove was red and white, the colors of his Terrier’s uniform. But for some reason it wasn’t his. He couldn’t feel it, or the hand of the trainer that was moving it back and forth. It was as though it had been cut off of his body. Little did he know, it had. The nerves that were damaged in his neck made it so that messages couldn’t reach his brain. The nerves that were being touched couldn’t send the message that would make Travis aware of the sensation. As a listener I found myself without words. It was hard, in fact impossible, for me to imagine losing control of my entire body. And not only that, having to get up every day and face your problem head-on. This, by no means, is a problem you can ignore. It is something that is present in every second of your life. The accident has left Travis a quadriplegic. This means that he has no use of his arms and legs. This is brought on by a high spinal cord injury or a stroke. Travis broke the fourth and fifth vertebrae in his spinal cord. These are high on the spinal cord and this break has left him quadriplegic, although he does have some mobility in his right arm. The only damage that the accident has done is physical. His mind is still the same mind. When it tells his leg to move and it doesn’t, frustration is always there. He had tasted the sweet luxury of movement, a luxury that we all take for granted. And he didn’t just taste it. It was what he knew for 20 years! I mean it almost would be better if he had never been able to move, but where would he be? As his father said, “Some things choose you.” This certainly was something that chose Travis and his family. But Travis didn’t let this slow him down. Only 10 months after his injury he returned to BU. Four years later he was a graduate with a degree in Public Relations. He didn’t stop there. 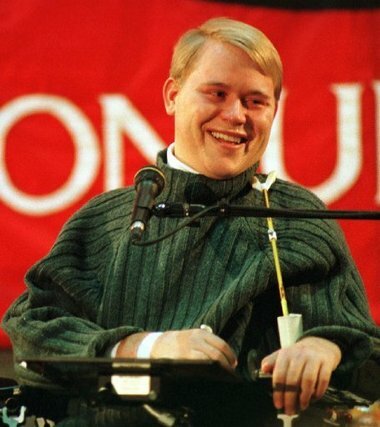 Perhaps the most ironic part of the entire thing is while at Tabor High School in his senior year, on his twentieth birthday, he gave a speech he called “Travis Roy’s 10 Rules to Life”. In this speech he outlined the rules that he lived by. His second “rule” was to never take things for granted. He knew he was lucky to be attending a private school. He knew that he was privileged and made sure to never take that for granted. His seventh “rule” outlined his definitions for love. He talked about his love for a girl, his family and a sport. In his tenth, and final rule he said that “My life is just beginning and there will always be more lessons to be learned.” He says that sometimes it is hard to believe that he gave that speech before the accident and not after. He feels that these rules govern his life so much more now that the accident has happened. Hearing about this experience has changed me as a person. Since last Wednesday when he gave his speech I have thought long and hard about the value of life. I learned that it is something that is priceless. You have to be ambitious just as Travis was. Set goals and do all that is in your power to reach them. Travis reached his goal. He can look back at that check on his list and feel proud. He did what he set out to do. Although it was short lived, it was lived. As listeners we must take this as a learning experience and aspire to our bigger dreams. Limits make unhappy people. Set goals, reach them, and when you check it off your list be sure to thank Travis. He has inspired us all to do great things. He has also taught me a thing or two about love and pride. Your family has this undying love for you. They want to see you succeed. I have also learned that it is okay to be proud of yourself. When you do something that you know is good. Let yourself be proud. And when you’re feeling down don’t be afraid to cry. I hope that when Travis looks back at all that has happened in his life he is proud of his accomplishments. He not only was a fantastic hockey player, but he has become a role model who guides people through some of the toughest times of their lives. To honor saying “I love you” more often, I know that I speak for many when I say, “we love you.” Thank you Travis for all that you do.